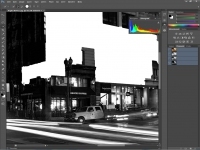 Adobe Photoshop CS6 - Supported software - PlayOnMac - Run your Windows applications on Mac easily! THIS SHOULD ALSO WORK WITH THE ADOBE CC VERSION OF PHOTOSHOP. NOTE: This application does NOT work on Intel graphics (at least not that I have seen). Nvidia and AMD graphics should be used. "Adobe Photoshop CS6 Extended delivers all the imaging magic in Photoshop CS6 plus 3D graphic design and image analysis tools. * Easily create rich 3D artwork, and enhance your 3D scenes with shadows, lighting, and animation. 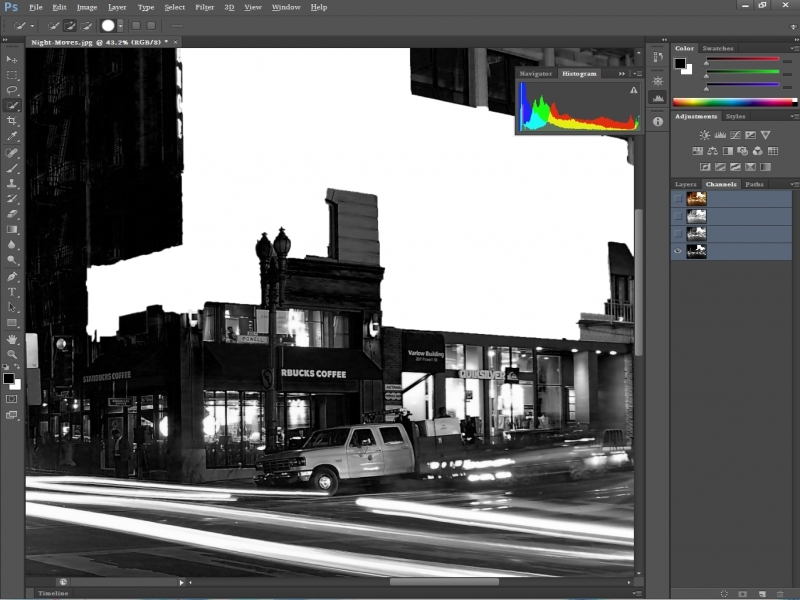 Retouch images with utter precision, control, and speed. Create vibrant videos and design anything you can imagine using intuitive tools. Paint and draw naturally and expressively. And get blazingly fast performance with the Mercury Graphics Engine." POL_SetupWindow_message "$(eval_gettext 'NOTICE: If you get an error saying that the installation failed, wait at least 5 minutes before closing it. PlayOnLinux will finish the install, even though it crashed.')" "$TITLE"
POL_SetupWindow_message "$(eval_gettext 'NOTICE: Online updates and any 3D services do not work. If you want to update your install, you will need to download the update manually and install it in this virtual drive.')" "$TITLE"
Hi all, I'm having a little problem with True Type fonts not being recognized in Photoshop, for example: CCWildWordsInt Bold Italic, CCPascualFerry-Regular etc. Is there any solution for this? I tried several Linux distribution on my laptop but I can't run Adobe photoshop cs6 any of them. 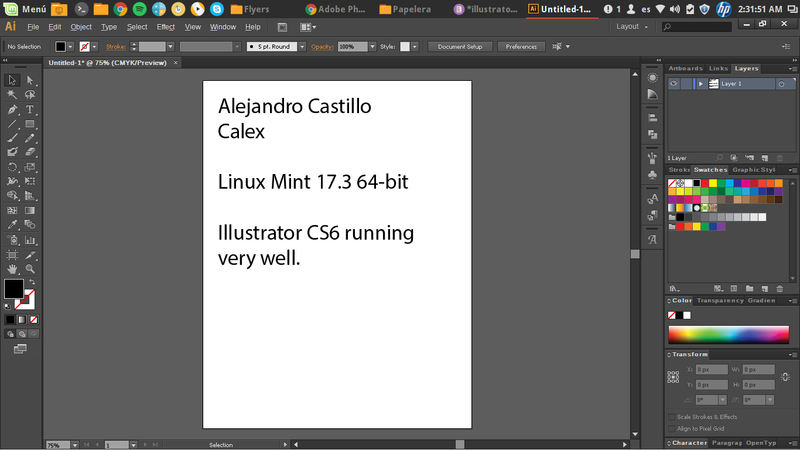 In my laptop already have old linux ( debian 7.3.0) and in their, Photoshop cs6 working well with wine version 3.7 which I installed that 2 years ago. Here can't find any script run with wine version 3.7.
wine: configuration in '/home/abdilahi/.PlayOnLinux//wineprefix/PhotoshopCS6' has been updated. 0009:err:shell:HCR_GetFolderAttributes should be called for simple PIDL's only! 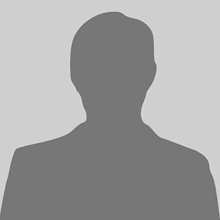 wine: configuration in '/home/abdilahi/.PlayOnLinux/wineprefix/PhotoshopCS6' has been updated. wine client error:0: version mismatch 547/536. I have the same problem like him in my ubuntu 18.10. every time i get error1. If your program is running, just ignore this message. 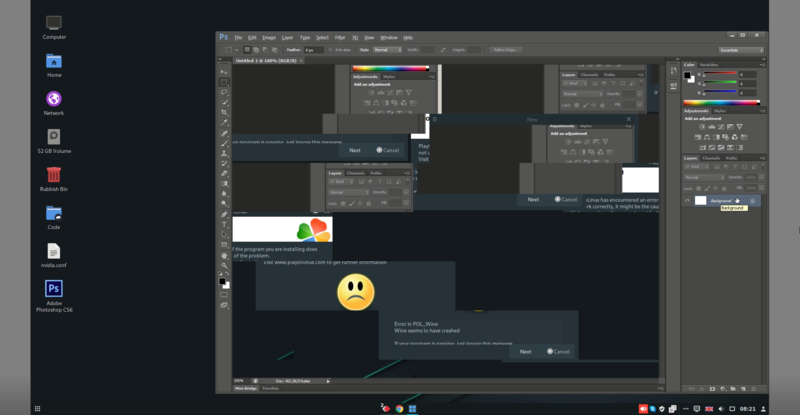 The program installs without a problem, but when I open it this is what I get, the interesting thing is that when I try to draw on newly created file, I can see that it draw thing in layers section, but nothing is displayed on the artboard. For me turning off "Graphic processor" fixed the problem. Photoshop CS6 -> Edit -> Preferences -> Performance -> uncheck "Use graphic processor"
This worked pretty well for me. It actually installed my copy of Abode Creative Suite Master Collection 6.0. Just had a few issues creating shortcuts for some reason, kept complaining about wine path and had to keep switching wine versions so it would see wine was installed correctly. All the apps installed and run with the exception of two (64bit applications). Changed from wine 3.3 to wine 3.4 and removed both of the 'SetOS = winxp' lines. Both of those steps were necessary to make Photoshop load. You have to pay for this version of Photoshop right? Of course. We provide no software like that. Wine 1.7.46-staging doesn't work fine on Ubuntu 18.04. Wine 3.3 did the job for me. Why do you use Set_OS function twice? @linuxscripter because it needs to be set for installation dependencies. At least at the time I wrote the script it did. That is not a sin to do that, BTW. I've written quite a few scripts and functions and sometimes it's required to automate the process. Ah. I see what you are saying. It's setting the same one twice. I will test that later. It originally declared win7 then xp (or vice versa), and it got changed along the way. My bad. Lol. @soachishti please verify that this works with screenshots and your debug output. You will need to wipe the virtual drive for previous installs before trying again. 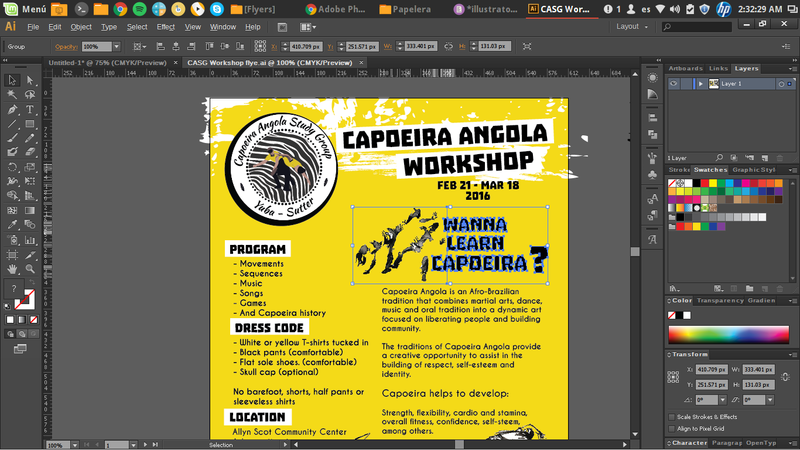 Photohop CS6 was working good on Ubuntu 18 but Photoshop performance was slow/lagging (like using over teamviewer). I tried Set_OS=win7 but no success. However I am on Ubuntu 16 now and with Set_OS=win7 and WINE=3.4, it is working great. Word. I will update shortly. I`m in china,this program can`t recognize the chinese.Please tell me how to fixed it. Hello, thank you for the program. Unfortunatelly the program is not working. Whenever I run my Adobe Photoshop CS6, an error pop ups "pol_wine" error. And the program is closed. I need help. But.. It only worked after I put Wine in Windows XP. Somhow Windows XP was set as version. Maybe: Set_OS "winxp", in the sript doesn't work anymore..?! It jumps around because it needs to set other things up as XP. I will change that real quick. When I try to install Photoshop CC the installer says, that i need a64bit system Version. i have a little problem, Photoshop starts perfect after i install de POL vcrun6 but if i want to open a new image or if i load an image i get this Screen,,,, anybody an idea what can i do ? Which graphics card/drivers are you using? I have no clue. I can't replicate the issue. Post your debug logs and lets see if that shows anything. I had this problem myself and managed to fix it. Fix: Go to Edit > Preferences > Performance and uncheck "Use Graphics Processor' . I have a GTX 980 myself, what do you use? I hope this gets a better fix because Photoshop is a lot more laggy when not using my GPU. Successfully installed CS6 version. But can't run it on Linux x86_64. Tried both staging and system's wine versions. Same result. fixme:winediag:start_process Wine Staging 1.7.46 is a testing version containing experimental patches. fixme:winediag:start_process Please report bugs at http://bugs.wine-staging.com (instead of winehq.org). wine: configuration in '/home/<user>/.PlayOnLinux//wineprefix/PhotoshopCS6' has been updated. err:shell:HCR_GetFolderAttributes should be called for simple PIDL's only! Unhandled exception: page fault on read access to 0x00000011 in 32-bit code (0x4ec7c1f6). In my it worked to go to Configuration --> Configure Wine --> Windows Version: Windows XP (was: Windows 7). This fixed it for me. You need to start a thread in the forums with your computer specs and debug log. Without any information about your system or logs, we could only guess. It gets an error when downloading Tahoma32.exe. The host of Microsoft doesn't work. Firefox no sabe cómo abrir esta dirección, porque el protocolo (playonlinux) no está asociado con ninguna aplicación. Read the wiki to learn how to use PlayOnLinux. I'm having problem with the healing brush tool; the alt+ click is not working; is a problem with photoshop or is a configuration problem with linux mint? fix on Linux mint mate. Probably a problem with Wine itself. Check winehq.org and see if a fix may be available. I am working from my phone at the moment and can't look into the issue at this time. It may actually be because of a hockey associated with the ALT key, but I can't test it right now to be sure. By default many distros bind [ALT] + Left click to drag windows around your desktop and that's why its not working. Unbind or reassign the [ALT] key in your OS. This script works for Adobe Illustrator CS6 as well. So, the new wine-staging version works with PS. Probably works with Lightroom, as well. 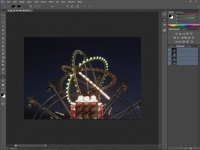 One thing that I figured out is that this seems to work really well with Adobe Creative Cloud; I can connect to my account and download and run PS and LR so far. I am going to make a separate script for Adobe CC, though (I anticipate the CC versions needing more TLC than the regular versions before they went into cloud services. Sounds good to me. :) I will make sure that I keep that in mind. I will also try to go back and update any older scripts that I can with -staging releases. I know for a fact I cannot do it with Reason 5 (it is a one-off patch, specifically for that program), but I should be able to update the others, as long as the -staging WineBuild works. Can I use The complete creative Suit CS6? or just Illustrator and Photoshop CS6 with POL? Tested with Illustrator, it installs but does not run, Error 16, some problem with permissions according to Adobe forums. Edit: CC does not work, CS6 does. Can I use a wacom tablet with this software on POL? Changing order of Windows version call. I'm experiencing some issues related to fonts. Menus with problems: Image Size, Duplicate Layer and New option Menu. How can I send screenshots showing problems? Please post in the forums with your full computer specs and debug log and we can take a look at it. Adding better note before PS install actually starts. -POL_SetupWindow_message "$(eval_gettext 'NOTICE: Ignore the error at the end of the install that says that Photoshop failed to install.')" "$TITLE"
+POL_SetupWindow_message "$(eval_gettext 'NOTICE: If you get an error saying that the installation failed, wait at least 5 minutes before closing it. PlayOnLinux will finish the install, even though it crashed.')" "$TITLE"
POL_SetupWindow_message "$(eval_gettext 'NOTICE: Ignore the error at the end of the install that says that Photoshop failed to install.')" "$TITLE"
Just curious, does Josefin Sans not work correctly for anyone else? Adding revised Tahoma installer to help fix missing font issue on certain machines. Ok ok ok. This is now FIXED! The missing fonts from certain systems should now not be a problem. No virtual desktop needed. The fix is ready to go. Enjoy! That is not something that I can really fix. That is something that will need to be worked by the Wine team to see if it is a bug in Wine itself. gdiplus already installs with this, so there is no need to install it, but if that does not help, I am not sure. Let's see what the Wine team says (I noticed you said you launched it with POL; they are likely going to close your bug report and tell you to run it with regular Wine. Just a warning. They have done it to me before. They like to only work with plain Wine. lol.). I'd really almost call this a show stopper... I can't create new documents because the dialog is smooshed beyond recognition. I'm not sure what is causing this either or how to troubleshoot it? Can you post a screenshot? Can you try it with a different desktop environment like KDE, Cinnamon, XFCE, or something? I don't have that issue on my system at home, so I am not sure. Also, what did the Wine team say about the bug? I mean, it cannot be doing this on every system, because with over 21,000 downloads, I would imagine a lot more people would have reported this. No labels on the layers is something that is still an issue with Wine, so hopefully they will come up with a fix, but as for the image previews, I just don't know what would cause that. I am running Kubuntu 14.04 on my system, and it seems to work great. I have to imagine it is an issue with Wine, but we would need the Wine team to troubleshoot it (I personally don't know C or C++) and create a fix, though I would have to imagine there is a fix, as it seems to work fine with how it is set up on my systems. Has there been any movement on the bug report at winehq? Nothing on the bug report at winehq from what I can see or have got in my email. "i have already installed microsoft paint at play on linux, and then, i just copy font folder from Playonlinux virtual hard drive > ms paint > drive_c > windows, paste that at Playonlinux virtual hard drive > photoshopcs6 > drive_c > windows, and that fixed, im sorry too late to answer :)"
I am going to be adding this fix into the script pretty soon, but for the time being, try that and see if it helps. Your screenshots pretty much match the same issue the user below brought up. That is odd... I am not sure why it wouldn't show up. Unfortunately, I have no clue which exact font it is wanting, but that is for sure why the fonts are not showing up. I just wish I had some more concise information, but if a lot people are having this issue, they are not speaking up about it, which makes it hard to troubleshoot. If I figure out anything, I will, of course, be updating this script to make sure that it is up-to-par. Well actually, the fonts are working inside Photoshop, its just that the dialogs are all smooshed. Like its not reading the size the fields are supposed to be? If I hit a dropdown I see the options. I saw that article. Give it a shot. I am running whatever the newest version of CS6 is (NOT CC), which I got last year, so it is likely the 2013 update. I haven't checked. Image preview still does not work, so I'll stand on the winehq bug report to get that sorted out. Thanks! SWEET. Thank you SO much for getting me the list of fonts. I will be adding that to the script to make sure have that covered in the future. Glad you got it figured out. If you they get a fix implemented, let me know, and I will get the patch(s) and get a POL-Wine build ready. Thanks VERY much. Yeah. 3D does not work, and will probably be a while, but that is a very small part of PS, so I am not worried about it. None of the fonts listed made any difference. What else did you do, exactly? I am working on this now. I had the "smooshed dialogues and unlabeled layers" glitch, but was able to fix it by going into configure, making sure the core fonts, Tahoma fonts, and gdiplus were installed. Then under Display, I made sure to choose gdi under Direct Draw Render. It works great. Hope this helps someone in the future. THIS SHOULD WORK WITH THE ADOBE CC VERSION OF PHOTOSHOP, AS WELL. Thank you very much for your work, I tested with the offline installer photoshop cc 32-bit and it works. Have missing text labels like in current screenshots been fixed? Hard to work without layer names and all dialogs without text. Increasing dpi in 'configure wine'->'graphics' also increases label rectangles a bit and words get partially shown in Preferences, so it may be not a font problem. I know. It only does that on certain distros. The user below apparently found a fix, but he has not replied. I even sent a private message, but with no answer. I wish he would tell us how he fixed it. If you can get him to give an answer, please repost the solution here so that I can try to implement it. Lol. So, I sent the user below another pm about this, and still no answer, which is weak, because I have a system still doing that and I cannot find the solution. If anyone figures it out, I urge you to post here with the solution, so at least it it documented. im sorry, i have a problem, when i click the "install program" this computer not do anything, can you help me to fix this problem? Do you have the installer for this program? Don't install manually. You need to have the installer (you need to own CS6), and when the Install program asks you for the installer, you just select it. POL does not install the software if you do not own it. You have to have an actual copy. Delete the Photoshop virtual drive, click INSTALL on PlayOnLinux, and when prompted, select the .exe installer for Photoshop. If it still fails after that, pastebin your debug log here. It simply looks like you didn't tell it where your photoshop installer is at. amazing works! but in my photoshop, i've lost some text, would you like to help me prove this problem? im sorry, i've solved my problem about the text! thx for you attention admin! How did you fix the text problem? I am just curious. Excellent. Can you do me a favour and list the fonts in the ms paint folder? It must be one specific font that makes it break. Thanks so much for them help. but now, if i import an image to photoshop, the photoshop not responding, i try to make new layer and still not responding, would you like to help me? Pulling this out of "testing", as after almost 4,000 downloads, I would imagine that any major bugs (aka 'show stoppers') would have been reported. Teehee. This is a good thing. POL_SetupWindow_message "$(eval_gettext 'NOTICE: Install will fail and program will not launch with Intel graphics. Use only AMD and Nvida cards. Ignore the error at the end of the install that says that Photoshop failed to install.')" "$TITLE"
Hi, thanks, by this script I install Photoshop CC, not only CS6. Maybe you add this fact in description? It is not the same program, so I would need to see tests confirming that every feature works like CS6 before I make a unified installer. If anything, I may obtain the demo for CC, and write a different script for that. I feel that it would be better, since they are not the same program (though I do understand the relationship). That is what I was thinking, as well. I would much rather have them apart from each other, simply because if something changes in CC and breaks compat. with CS6, then I would need to separate them anyway. I should be able to get to that within the next couple of weeks, after I am able to test CC and make sure that it works. Added note stating that Intel graphics will not work. I looked a lot into this, and it seems most Intel graphics will not run this app. I am going to test it on an AMD laptop later. +POL_SetupWindow_message "$(eval_gettext 'NOTICE: Install will fail and program will not launch with Intel graphics. Use only AMD and Nvida cards. Ignore the error at the end of the install that says that Photoshop failed to install.')" "$TITLE"
Changed to Win7 before PS install. So far it is working great on my desktop (kubuntu 14.04 64-bit), but my laptop (Mint with Cinnamon, 64 bit), it keeps crashing during install. I know it has something to do with connecting to the internet. I install libgnutls and libcrypto* and all of that, and I am pretty sure that I have it covered, but there is something on my desktop that lets the install work fine, and my laptop seems to be missing it. Unfortunately, I am having a very hard time checking what is missing. haha. Graphic drivers? Same wine version? Completely different system. Intel chipset, same exact script. I actually cleared out the ~/.PlayOnLinux folder and rebooted my laptop and I am trying again. For some reason, I want to say that something failed to install into the virtual drive correctly or something. Just before it crashes, it would throw some wbemproxy errors, but those only showed up on my laptop, not my desktop, which is odd.
" But I do not think that is causing this. Not just yet. Lol. It has to connect online to register, otherwise it just won't work. Again, I have it working on my desktop, but the laptop will not work. Is there a way to check what 32-bit libraries I have installed on both machines, that way I can diff them? Initial commit. Will add screenshots and resources later. +POL_SetupWindow_message "$(eval_gettext 'NOTICE: Ignore the error at the end of the install that says that Photoshop failed to install.')" "$TITLE"
+POL_SetupWindow_message "$(eval_gettext 'NOTICE: Online updates and any 3D services do not work. If you want to update your install, you will need to download the update manually and install it in this virtual drive.')" "$TITLE"
Ok. I will make that change real quick. It worked out for me. I have Linux Mint 18 - Mate. I had issued when I installed, because the huge file of 300mb was always interrupted by something I couldn't find. Finally, I got it after 10 times trying.